Gage Eden cut his teeth at PJ Morgan Real Estate as one of the most enthusiastic interns we’ve ever seen! He was always at the ready, wrestling whatever was asked of him at lightning speed and with great care. His exemplary work ethic has led us to proudly “officially” welcome him to our team as a property manager and sales and leasing agent. 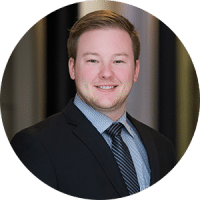 Gage’s love of real estate shines through his quest for knowledge, genuine concern for his clients and his keen eye for detail. His priority is to protect their interests, while working toward mutual success. He has a passion for the commercial side of the business and was a great asset to our work on Boxcar 10 in downtown Omaha. Gage is a Midwest native and grew up in Atlantic, Iowa. He graduated in 2016 with a Bachelor’s degree in Business Management from Northwest Missouri State University. Although he’s a proclaimed workaholic, he manages to find time for fun on the weekends playing music. Gage, you have been more than helpful and I appreciate it immensely. Since Gage took over as our property manager, our building quality of life has improved markedly. We had a problem with people sleeping in the vestibule and on the top floor of the building, and Gage prioritized getting the fob system installed to improve the building’s safety. It had been talked about by prior management for over two years, but Gage took care of it immediately. He is very available and responsive to texts and calls from me as a tenant. He is respectful and takes action quickly to resolve problems. For example: the carpeting in the elevator had needed replacement since we moved in two years prior. Gage saw the situation, found a roll of carpeting in the building and had it replaced. When we had issues with our garage doors, he went out of his way to assure all tenants’ needs were met and arranged for unseen costs (transportation, parking, etc) to be paid out as well. When there is a manager that is as responsive, respectful and effective as Gage Eden, it encourages residents to continue their leases, and to refer others to the building. It is gratifying to know that Gage is on top of bringing the building to the highest standards possible. We want him to continue as our building manager for years to come!